Are selfishness and individuality—rather than kindness and cooperation—basic to biological nature? Does a "selfish gene" create universal sexual conflict? In The Genial Gene, Joan Roughgarden forcefully rejects these and other ideas that have come to dominate the study of animal evolution. Building on her brilliant and innovative book Evolution's Rainbow, in which she challenged accepted wisdom about gender identity and sexual orientation, Roughgarden upends the notion of the selfish gene and the theory of sexual selection and develops a compelling and controversial alternative theory called social selection. This scientifically rigorous, model-based challenge to an important tenet of neo-Darwinian theory emphasizes cooperation, elucidates the factors that contribute to evolutionary success in a gene pool or animal social system, and vigorously demonstrates that to identify Darwinism with selfishness and individuality misrepresents the facts of life as we now know them. 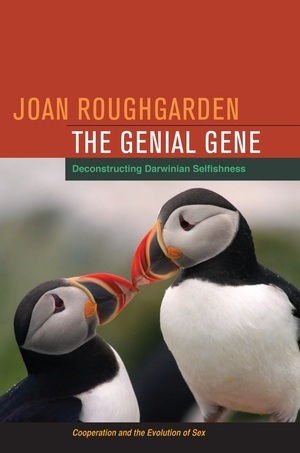 Joan Roughgarden is Professor of Biology at Stanford University. She is the author of Evolution's Rainbow: Diversity, Gender, and Sexuality in Nature and People (UC Press), Evolution and Christian Faith, and Primer of Ecological Theory.